I hope you have all had a great summer and managed to relax. 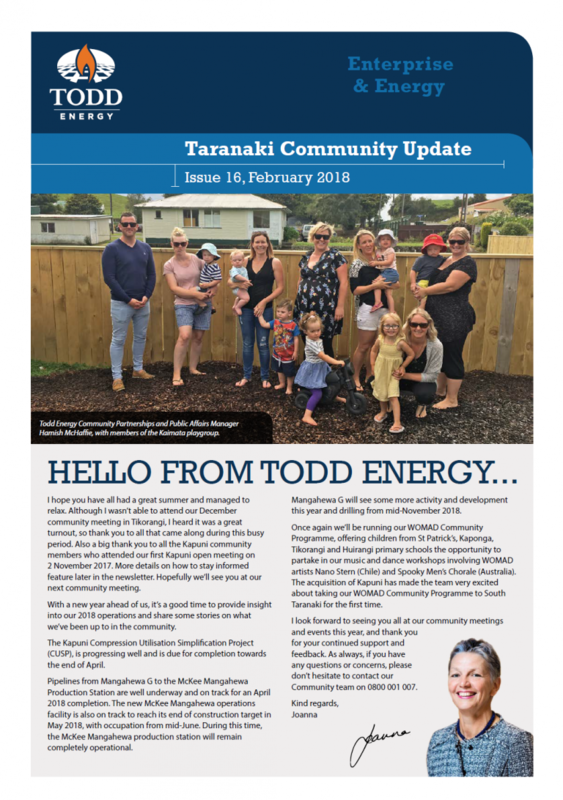 Although I wasn’t able to attend our December community meeting in Tikorangi, I heard it was a great turnout, so thank you to all that came along during this busy period. Also a big thank you to all the Kapuni community members who attended our first Kapuni open meeting on 2 November 2017. More details on how to stay informed feature later in the newsletter. Hopefully we’ll see you at our next community meeting. With a new year ahead of us, it’s a good time to provide insight into our 2018 operations and share some stories on what we’ve been up to in the community. The Kapuni Compression Utilisation Simplification Project (CUSP), is progressing well and is due for completion towards the end of April. Pipelines from Mangahewa G to the McKee Mangahewa Production Station are well underway and on track for an April 2018 completion. The new McKee Mangahewa operations facility is also on track to reach its end of construction target in May 2018, with occupation from mid-June. During this time, the McKee Mangahewa production station will remain completely operational. Mangahewa G will see some more activity and development this year and drilling from mid-November 2018. Once again we’ll be running our WOMAD Community Programme, offering children from St Patrick’s, Kaponga, Tikorangi and Huirangi primary schools the opportunity to partake in our music and dance workshops involving WOMAD artists Nano Stern (Chile) and Spooky Men’s Chorale (Australia). The acquisition of Kapuni has made the team very excited about taking our WOMAD Community Programme to South Taranaki for the first time. I look forward to seeing you all at our community meetings and events this year, and thank you for your continued support and feedback. As always, if you have any questions or concerns, please don’t hesitate to contact our Community team on 0800 001 007.